General Description: The Brewerton Corner Notched is one of four types (Corner Notched, Eared Notched, Eared Triangle, Side Notched) in the Brewerton family of points. The Brewerton Corner Notched is a small to medium sized, relatively thick corner notched point. The blade is trianguloid in outline and biconvex in cross section . The edges of the blade are slightly excurvate, less often straight and rarely incurvate . The stem is corner notched with medium to large corner notches forming prominent barbs, and basally expanded . The base is straight to slightly convex or rarely slightly concave. About two-thirds will have their base ground smooth. The proportions are one and one-fourth to one and one-half times as long as wide. The larger examples are about twice as long as wide. The size of the Brewerton Corner Notch ranges from 23mm to 80mm in length. The majority of points fall between 33mm and 59mm. The thickness ranges between 4.8mm and 9.6mm with the majority being about 8mm. The Brewerton Corner Notched is a minority point type in the Archaic Brewerton complex of Laurentian and the Frontenac complex of New York. There is some evidence that the Corner Notch point type appeared later than the Brewerton Side-Notched type. 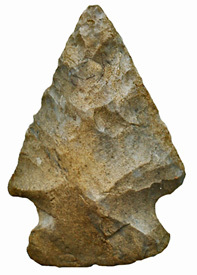 The Vosberg Point of eastern New York differs from the Brewerton Corner Notched type in its shorter stem, smaller notches and usually weaker barbs. The two forms do however overlap and appear to be genetically related and are generally contemporaneous. The Brewerton Corner Notched is primarily found in central and western New York and is also present in eastern New York with occasional examples found as far south as central New Jersey and as far east as New England. Similar points occur as a minor distribution in the Upper Ohio Valley, Eastern Indiana and Pennsylvania. 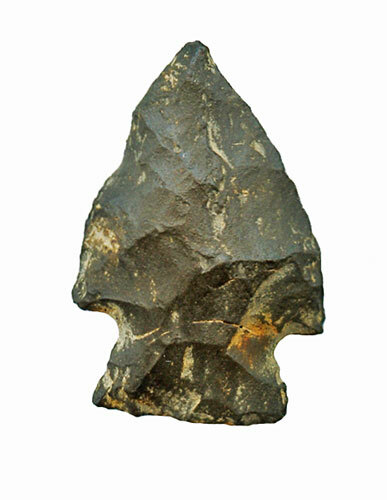 The point is usually made of NY Onondaga gray flint in the New York area but can be made of local materials such as cherts, jasper and quartz. In Ohio, the point was made from Logan County cherts (a speckled Cedarville-Guelph flint) as well as Laurel and Harrodsburg, Indiana cherts. The point was named by William A. Ritchie in 1961 for an excavation at the Robinson site in Brewerton, Oswego County, New York. Prior to 1961, the Brewerton Corner Notched was called the "broad corner-notched point" (Ritchie). Perino states that the Brewerton Corner Notched point, when resharpened to the point that the barbs are missing may be known as the Brewerton Eared Notched Point then if continually reworked it may become the Brewerton Eared Triangular Point . The Vosberg point type seem to be a variant and cannot always be separated from the Brewerton points from a typology perspective (Perino). The Freeheley point type of Michigan is probably a Brewerton point type which suggests a wider and more western geographic distribution.(Hranicky). According to DeRegnaucourt, heat treating was present on 50% of the samples he has seen from western Ohio and eastern Indiana.